Here’s a good way to put that crock put to good use. These black-eyed peas and collard greens make a fabulous meal with baked cornbread and a salad. Black-eyed peas and greens are a natural combination and with the addition of some aromatics the dish becomes spectacular. Use fresh collard greens or a combination of collard greens and turnip greens. Fill the sink with cold water. Wash the collard greens in 3 to 4 changes of water, or until there is absolutely no grit on the bottom of the sink. Cut thick stems out of the greens and chop the leaves or cut them crosswise into strips. Even if the package says “cleaned,” rinse the greens thoroughly. In a large skillet, cook the bacon until cooked but not crisp; remove the bacon to paper towels to drain. Add the chopped onion to the skillet and cook until lightly browned. Add the greens, a handful at a time, until all are added and have wilted from the heat. Cover the crockpot and cook on low for 4 to 6 hours or on high for 2 to 3 hours. Taste and adjust seasonings with salt and freshly ground black pepper, as needed. Beets are very much a hot food item these days and should be one of your cold weather crops. For a quick and easy recipe, try these sweet-and-sour pickled beets. Use a mix of red and golden beets, if you like. Pickled beets have a long shelf live so make extra to have on hand. They add a great tang and color to a fresh cole slaw, bright flavor to a cheese board and earthy notes to a spinach salad (with the greens you picked from your garden). The pickling liquid is a great base for other vegetables you might have in the fridge including cucumbers, carrots and onions. 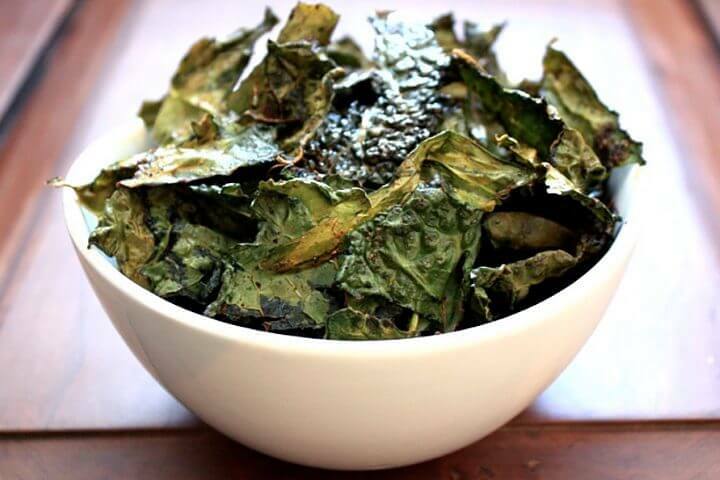 If you have a hard time getting your family to eat kale, try these crispy, addictive chips. They are wonderful served with sandwiches or they make a delicious, health snack just by themselves. If you want to spread the goodness, crumble them on salads or soups. Preheat the oven to 350°F. Spray two baking trays with cooking spray. Remove the center rib and stems from each kale leaf and discard. Tear or cut the leaves into bite-size pieces, about 2 to 3 inches wide. Wash the kale and dry it very well. Place the kale in a large bowl. Drizzle with the oil and sprinkle with the garlic powder and salt, and work the oil and seasonings into the kale with your hands to distribute evenly. Place the kale in a single layer on the baking sheets, and bake until crisp and the edges are slightly browned, 12 to 15 minutes. All cold weather crop recipes don’t need to be veggie-centric and good for you. After eating the healthy recipes above, treat yourself to this spectacular carrot cake. The pineapple adds terrific moisture and a bit of sweetness. Yum! Turn oven to 350 degrees. Grease and generously flour two round cake pans. In a large bowl, mix the flour, baking soda, baking powder, salt, cinnamon, nutmeg and ginger. Make a well in the center and add the sugar, oil, eggs, vanilla and sweetened condensed milk. Mix the wet ingredients with a wooden spoon until the mixture is smooth. Pour the cake batter into the cake pans and place them on the same rack. Bake for 30-45 minutes, depending on your oven. Cool the cake completely before attempting to remove it from the pan or frost it. Removing the cake from the pan can be tricky. Hold the pan firmly in both hands and then shake it, one side at a time, to loosen it. Perform this step slowly and gently as this cake has a tendency to split. Frost. Cream cheese frosting is wonderful on this cake. Ah, a full belly is a great way to celebrate the harvest of your cold weather crops. Take pride in your efforts and enjoy the accolades as you share recipes prepared with food from your garden. Bon appétit.